The Business Unit options in Calxa Premier allows you to run reports or charts on one or more Departments/Projects. This selection is called a Business Unit Custom Selection and can be saved for reuse at any time. You can save as many Custom Selections as you like which will eliminate the need to manually select Departments and Projects every time you want to run a report. To create and save a Business Unit Custom Selection follow the procedure outlined below. To use this feature you should first have a firm understanding of Calxa Business Units. We recommend reading the help note – Understanding Calxa Business Units and Budget Versions. In Report Criteria, next to Business Units, click Edit. On the right hand side select the Department or Project heading to list the Department or Project Business Units. (note that the actual words may vary depending on the settings saved in Application Configuration->Terminology Settings). Select the check boxes of the Projects or Departments as appropriate, or use Advanced Selection. See the Advanced Selection section for more details on this. On the left hand side there is a drop down list of your existing Custom Selections. Each report has a special unnamed selection, <<My Report Selection>> which can be used to save a selection without the need to name it. To save your selection, use one of the following options at the bottom of the window. If you selected Save As, type a name for the custom selection in the box provided and click OK. The selection will now be available in the Custom Selections drop down menu. You can add a description to the selection- which can remind you or other users of the purpose of this list or what business units are included. To save the description click Save All and Close or Save Selected. Save All and Close, Cancel all and Close and the Close window X in the top corner will all close the Business Unit Selection window. 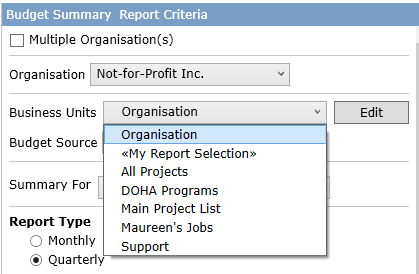 In the Report Criteria window you can select the saved selection you want to use from the Business Unit drop down menu. The same saved selections will be available on all reports and you do not need to click Edit to use a saved selection. Simply select it from the Business Unit drop down menu to use the saved selection on any report. 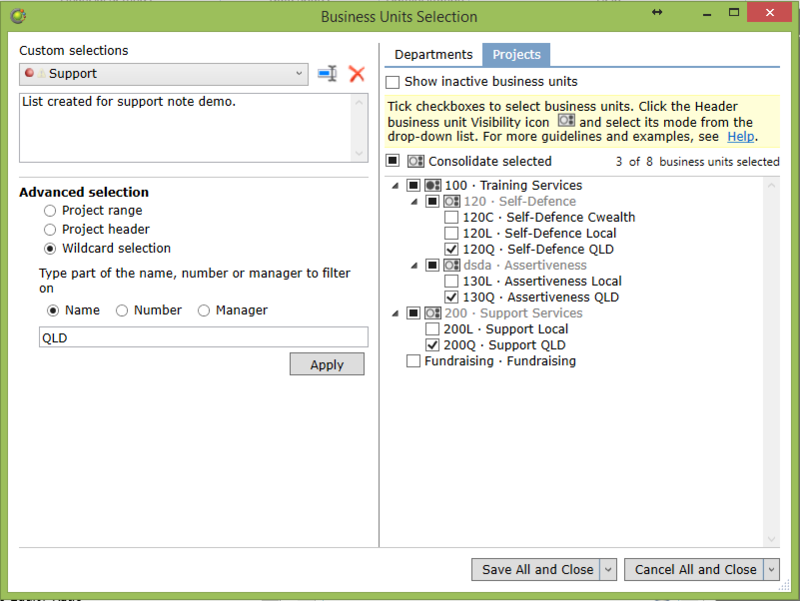 Refer to the help note – Running Reports for more details on selecting and using custom business unit selections. Note: <<My Report Selection>> is a special unnamed selection unique to that report and selecting this on other reports may result in different custom selections. 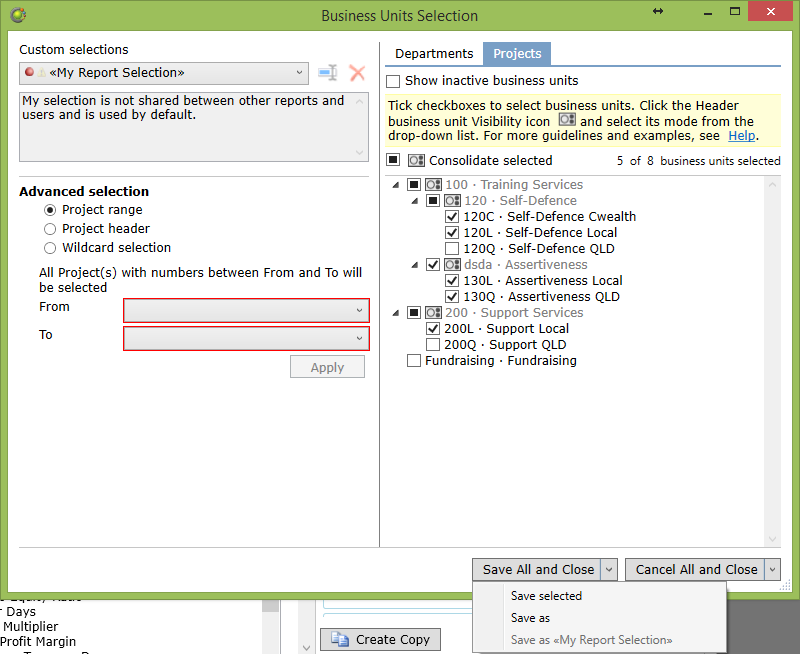 Consolidating Business Unit selections in Calxa is a powerful feature which can be particularly flexible if your accounting system supports a hierarchical business unit structure. For example Jobs in MYOB allow you to arrange detail Jobs under headers to create an organised hierarchy. Calxa allows you to set consolidation settings at each of these headers and run reports in one of the following modes; Detail, Consolidated, or Detail and Consolidated. To change the consolidation settings click the Business Unit Consolidation Icon and select the mode from the drop down menu. Detail is the default consolidation setting. When Detail is selected no consolidation will occur. In other words the report will show all the selected business units under that header individually. Click on the check boxes for the business units and/or headers that you wish to run detailed reports on, then click on the box next to the check Business Unit Consolidation Icon and select Detail. Note: There are slightly different icons for each selection. Further to this, when Detail is selected the detail Business Units are black while the header is grey indicating that the header (grey) is not consolidated while the detail (black) will be displayed. When you are satisfied with your selection, click on the Save All and Close, Save As or Save Selected options and the consolidations settings will also be saved to your custom selection. 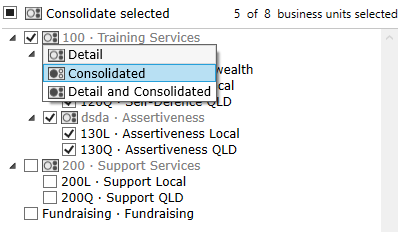 When Consolidated is selected all selected business units below this header will be consolidated. In other words the report will show a single summary report which is a consolidation of the individual detail business units. Click on the check boxes for the business units and/or headers that you wish to run detailed reports on, then click on the Business Unit Consolidation Icon next to the check box and select Consolidated. Note: There are slightly different icons for each selection. 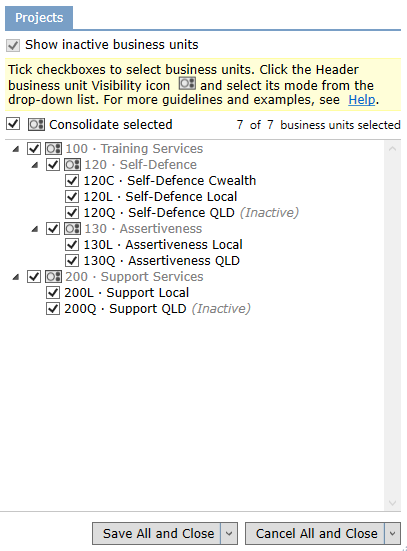 Further to this, when Consolidated is selected the detail Business Units are grey while the header is black indicating that the header (black) is displayed as a consolidation while the detail (grey) will not be displayed. 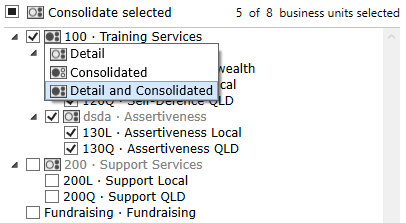 When Detail and Consolidated is selected all selected business units below this header will be consolidated. In other words the report will show all the selected business units under that header individually and a summary report which is a consolidation of the individual detail business units. Click on the check boxes for the business units and/or headers that you wish to run detailed reports on, then click on the Business Unit Consolidation Icon next to the check box and select Detail and Consolidated. Note: There are slightly different icons for each selection. Further to this, when Detail and Consolidated is selected both the detail Business Units and the header are black indicating that the header (black) is displayed as a consolidation and the detail (black) will also be displayed individually. 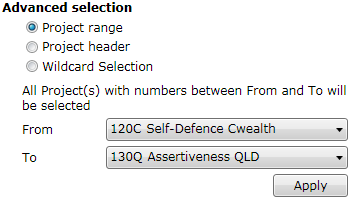 Advanced selection allows you to select multiple Departments or Projects that fit certain conditions in one step. You can make a selection based on a Project Range, Project Header, or Wildcard. Select Project Range, a From project and a To project, and click Apply. All projects in this range will be selected. Select Project Header, the Header project and click Apply. All projects under this header will be selected. Wildcard selection allows you to select Projects or Departments based on a wildcard that you provide. For projects, this wildcard can be applied to the name, number or manager taken form your accounting file. For departments it can be applied to the name or number of the department. Select Wildcard Selection and the field you wish to apply it to. Type a wildcard filter in the box provided and click Apply. 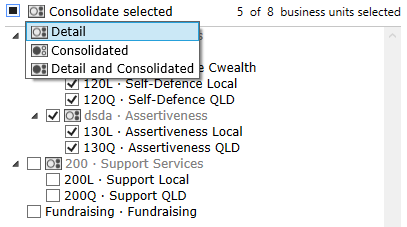 In the example shown below all projects with “QLD” in the name were selected. 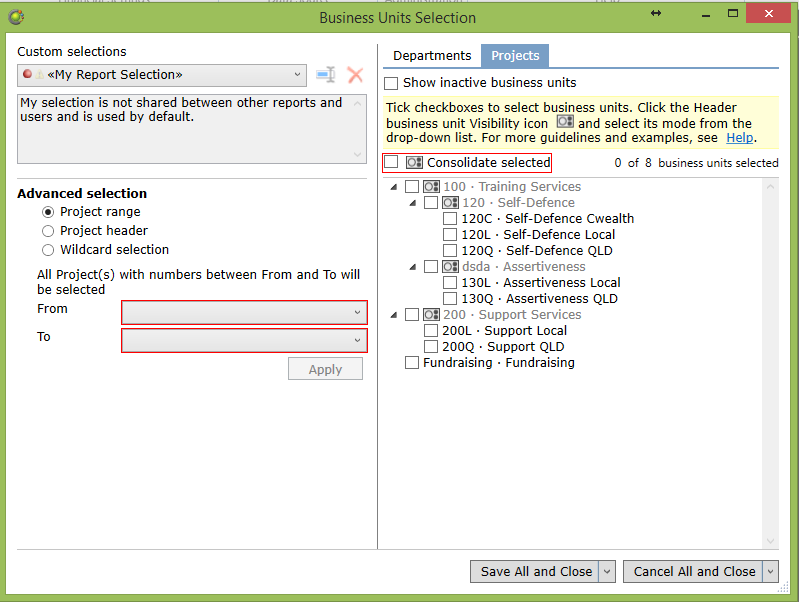 By default Inactive Business units are not displayed in the Business Unit selection window. You can however choose to display them if you need to run reports on inactive business units. Tick the Show inactive business units checkbox to display the inactive business units. Inactive business units are denoted by the (Inactive) status next to the business unit.